l Phoebe's pony, Carmel, gives his first ride ever to our neighbor girl, Myel. Training any animal is hard work! 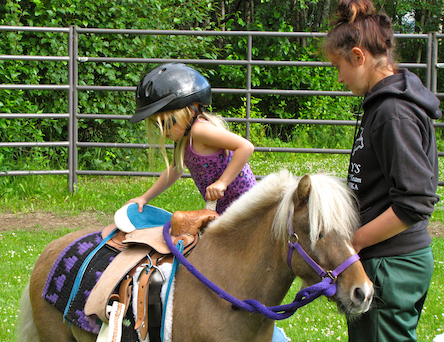 It's so important to start kids and animals at a young age as forming positive habits and practices is important. Carmel has been in training since he was 3! When he came to Red Fence Farm he had had a hard time getting along in his herd. He has blossomed with consistency, calmness, high expectations and love! 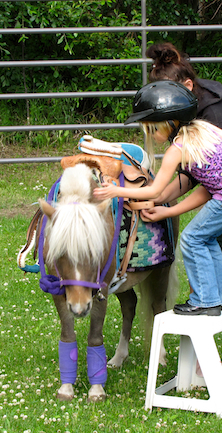 Kids working with animals need to practice these skills to inspire confidence from animals as well as trust. Carmel has been working up to carrying a rider for 2 years. Phoebe is dedicated to training him in a firm but kind manner and Carmel has learned to respect direction and commands. It was no accident that Myel's first ride was a success! She has learned to work with horses in a way that exhibits confidence and control. 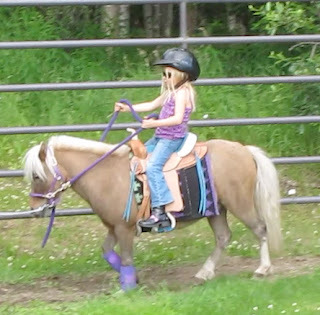 Carmel had a great first ride including riding in a round pen and out on the trails. He was a very happy pony and gave a very safe and enjoyable ride to Myel. Carmel most definitely has a future in ponying little kids around. He proved that today with his calm and responsible attitude. He has really come a long way and Red Fence Farm is proud to have him as a part of their family.